This walkthrough covers Akala Island Part 2 from the return to Paniola Ranch up to Kiawe's Island Challenge at Wela Volcano. This walkthrough covers Akala Island Part 2 from the return to Paniola Ranch up to Kiawe’s Island Challenge at Wela Volcano Park for Pokémon Ultra Sun and Moon. 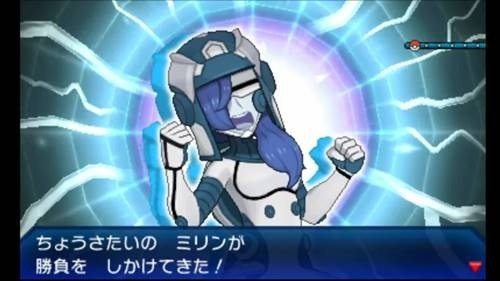 After finishing your trial with Lana, she’ll bring you back to the Poke Centre on Route 5 while giving you information for the next trial. From there, you can try capturing more pokemon to expand your team. Or, you could also try going fishing in hopes of finding a Water type pokemon to quench out the Fire pokemon in the Kiawe’s trial. TM41 “Torment” Climb the step on your right. TM59 “Brutal Swing” As you head down, grab it from Route 8. Return to Paniola Ranch and head straight down the path. When you reach the end of the path, speak to the boy standing next to the two Sudowoodoo blocking the path. He’ll then say that the Waterium Z will drive the Sudowoodo away so, approach the Sudowoodo and they’ll disappear. Suddenly, Soliera and Phyco make their appearance at Paniola Ranch with a small cutscene where Soliera will challenge you to a match. Battle her and defeat her Poipole to win 240 pokedollars. Once you defeat her, speak to the boy to get a Mystic Water which will power up water type moves. Head down Route 6 where you’ll find a Pokemon Breeder and a young trainer on your left side. Slightly south from them, there’s an item you can grab. Keep heading south until you trigger an event and see a Mudsdale. There, you find out that there’s a little girl named Hapu being harassed by the Skull Gang. Challenge the Skull Gang Grunt’s Lv 17 Drowzee and beat it to move on. After finishing the battle, you’ll have to watch out for another battle because Beauty Brittney is waiting there with a Lv 17 Cubone. When you’re done with the battles, head east and make your way to Royal Avenue. Mystic Water Boy near the Paniola Ranch after driving away the Sudowoodo. Revive In front of Dancing Family Jen and Fumiko. Head towards the Battle Royale Dome at the north of the city. Once you reach the dome, you’ll trigger a cutscene before entering. Then, enter the dome to start your Battle Royale Dome tutorial. While going through the tutorial, the Masked Royale will appear and challenge you to a battle. When you finish your battle, Hau will appear and you’ll have a short conversation with Trial Captain Kiawe. When prepared and ready, make your way down Route 7 to head for Wela Volcano Park. Ultra Ball Behind the Battle Dome Look for two Palm trees nearby. Tamato Berry Thrifty Megamart Talk to the sales associate that greeted you to get the berry. Lemonade Thrifty Megamart Approach the Drifloon in the back. On your way to Wela Volcano Park, you’ll spot a bay with a lot of Water pokemon. If you still don’t have one, start fishing for one since Kiawe relies on fire-type pokemon. You can use Lapras to surf but don’t use boost. Otherwise, you’ll scare the pokemon in the Rare Fishing Spot. Keep hanging left on the main road of Route 7 to finally reach Wela Volcano Park. TM32 (Double Team) Route 7 Walk over to the rocks beside the Water Hole. Max Repel Route 7 Climb up the rocky slope while heading south. Antidote Route 7 (Water) After fighting Swimmer Casey, it should be seen near the ocean floor. Make sure you have antidotes and burn heals. Players can also grab a Hyper Potion which is on the first ledge you see. Follow the path down until you reach a tunnel where you find a girl which will tell you where the trial begins. When you get to the area, speak to Captain Kiawe and begin your trial. Firium Z Defeat the Totem Pokemon – Alola Marowak. Then, approach Kiawe to receive the Z Crystal. TM39 (Rock Tomb) Head down from Wela Volcano Park. Travel along the north ledge near a Hiker trainer to find the TM lying there. Antidote Near the Trial Captain Guide. Charizard Ride After completing the Trial, Kiawe will register Charizard in your Poke Ride Pager. Quick Ball x 10 Given by Kiawe after completing the trial. Hyper Potion Left of the tall grass. Float Stone From the left path, jump down until you reach the second ledge. Go up the trial from the gate to find Captain Kiawe. Remember to heal your Pokemon through the Trial Guide by the gate. Since Captain Kiawe practices fire dancing, he will be challenging you to tell the dance sequences apart after he shows it to you. Third dance The Totem Pokemon. While you’re doing the first two dances, you will be challenged by a Lv.18 Alolan Marowak as well as a Lv.19 Magmar owned by the Hiker. Burn Heals and Super Potions will greatly benefit you here so make sure to bring some. After which, you will face up with the Totem Pokemon Alola Marowak, who is Lv.22. At the start of the battle, Alola Marowak gains 2 stages up of Speed. If you fished for pokemon in Route 7, this battle shouldn’t be too hard for you. 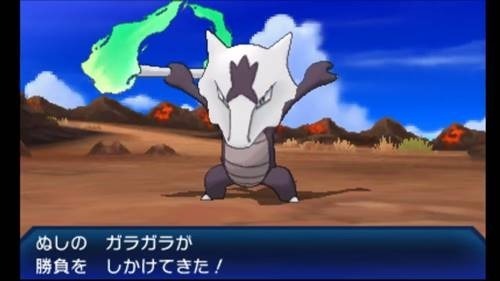 Alola Marowak is a Ghost/ Fire type which takes extra damage from water type attacks. You’ll probably have a Magikarp there and if you have it at level 20 and as Gyarados, you can easily sustain yourself from its attacks. But other Water Type Pokemon can defeat Alola Marowak and if you have Dark Type moves, it should deal heavy damage as well. Make sure you bring some Burn Heals to heal up the burns. After defeating him, you get a Firrium Z for Fire type Z moves. Not only that, you have a new pokeride: Charizard. Getting Charizard registered to your Ride Pager also means that you can now visit the Poke Pelago islands to get an endless supply of Poke Beans!